Yikes! I’m swamped with 9 to 5 work and freelance work combined. I’ve been slack in responding to emails and I barely have the time to keep up with reading my blogroll. My life will return to normal in about a month, but until then, I will be pushed and pulled in all directions. Dear readers, please forgive me in advance! Between bike rides along the seawall and eating burgers on a sunny patio, on Saturday I managed to head over to the treasure trove of Granville Island to pick up some dinner fixins’ at the market. So I offer you this short post now as a token of appreciation for all of you who keep on reading this lil’ space of mine. This lamb marinade works wonders on lamb chops but I decided to mix things up a little bit and create some lamb tacos. The smokey cumin flavour mixed with the cardamom was incredible and these tacos were pretty much gobbled up instantly. 1. Toss the first 6 ingredients into a ziplock bag, making sure all the spices and flavours blend. Marinate for 1 hour. 2. Prepare salsa in a small bowl by mixing the next 6 ingredients together. 3. In a very hot cast iron skillet or grill pan, add the contents of the ziplock bag. The lamb should brown very quickly. About 1 minute should do it. 4. Heat the corn tortillas over a gas flame to soften and slightly char. 5. 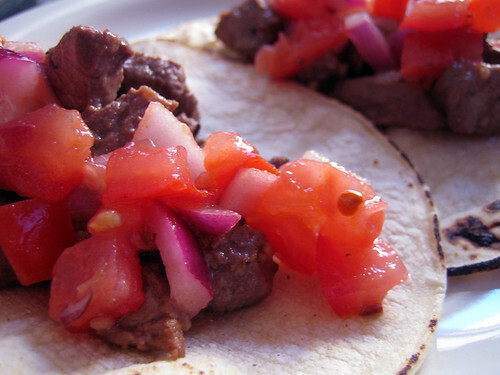 To each tortilla, add some lamb and top with the salsa. Eat and watch everyone fall in love with you. Sorry your so busy.. I know that feeling all too well. Tomatoes added colour to your dish. Sounds as if your plate is full too! I, too, work from home and know how great it is to have a more relaxed start to my day as opposed to getting up with an alarm clock and rushing out the door to grab the bus or subway in order to get to work on time…blech! Mind you, I do miss the interaction with other people which I don’t get from working alone at home. thanks linda! yes, i love lamb in almost any form! thank you, my space! i too loved how the tomatoes looked. so bright!